Brandt Sundean breaks for first base after connecting for an RBI single in the first inning. George Jenkins came into their state semifinal match-up with St, Thomas as one of the best teams in the state. For the first five innings, it looked like the Eagles were headed towards a state finals appearance. 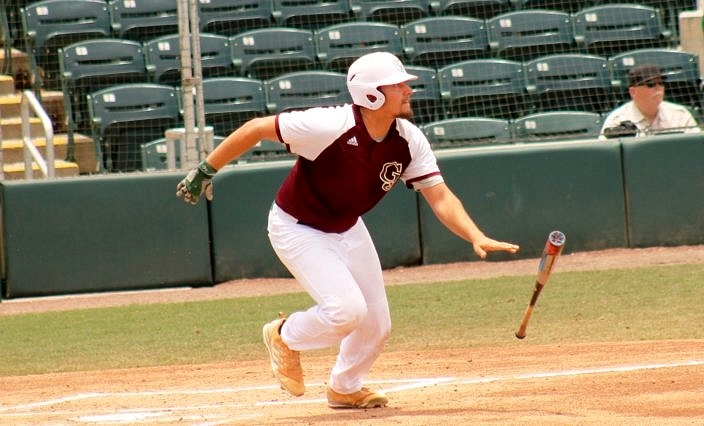 The Raiders, however, rallied in the final three innings, tying the game with a run in the seventh, and then three in the eighth, to secure a 6-3 semifinal win. Quality at bats helped put the Eagles in front in the bottom of the first inning. Brandon Howlett reached on an infield error, and Brady Allen walked. Brandt Sundean then delivered the first big dagger with a liner to center that easily plated Howlett. Jacob Herbert followed with a single to center that pushed Allen across the dish for a 2-0 lead. George Jenkins was back at it in the third. Howlett doubled to center, Allen walked and Herbert lined an RBI single to left field to make it 3-0. But that would be the extent of the Eagles offense on this day. 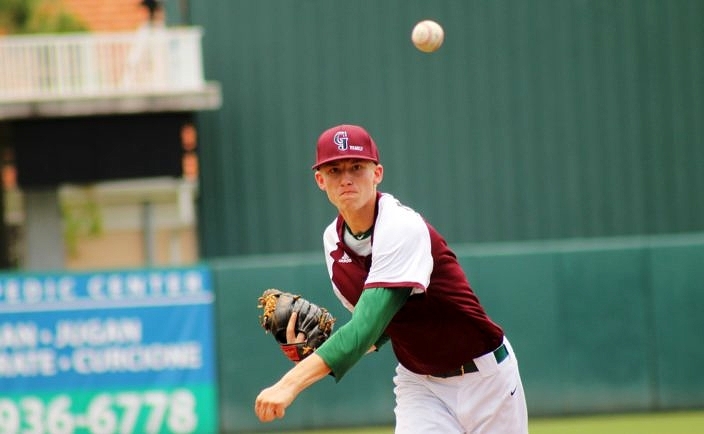 It has taken St. Thomas Manager Troy Cameron and his all-star staff some time, but the Raiders skipper has his team playing as fundamentally sound baseball as can be found in the state these days. And fundamentally sound teams that play not for themselves, but for each other, are the type of teams that overcome adversity and win state titles. There was no panic, there was no head hanging. Instead, there was the Raiders defense getting out of a jam in the third by executing first and third defense to perfection. Junior Daniel Batcher made the start for the Eagles but did not factor in the final outcome. Then there was Matt Archer singling in the top of the sixth, followed by a perfectly executed bunt base hit from Andres Antonini. Nick Vera, who earlier hit a home run to cut the lead to 3-1, then came through again with a first pitch sacrifice fly, scoring Archer. They were the type run producing at-bats that coaches dream of. Then, in the seventh, Gabe Terry, pinch-hitter Connor O’Hara, and Archer all singled. Antonini followed with a sacrifice fly, and suddenly the game was tied, and the momentum had shifted. After being frustrated by Jenkins starter Daniel Batcher, the Raiders bats remained patient, continuing to have quality at-bats. It was the type discipline rarely seen at this level of the state playoffs. Meanwhile, starting pitcher Blake Hely overcame a rough start to settle down and hold the Eagles scoreless in his final three innings of work. In the eighth, Cade Fergus singled to lead off the inning, After two outs, Ruckdeschel drove a ball that got over the right-fielders head, and Ruckdeschel was off to the races. As he rounded third, the Raiders fundamentals again came into play, as Fergus, who had earlier scored on the play, was in perfect position, directing Ruckdeschel to slide outside, away from the tag, which he did, as the Raiders fan base and dugout went wild. Finally, after 7.2 innings, St. Thomas had its first lead of the game. Although they had the lead, the Raiders would then have to play the waiting game to secure their first state final appearance since 2003. After Ruckdeschel’s home run, the tarps came out, and the game went into a lightning delay, as rain pounded the field. After several false alarms to get back on the field, and a nearly six hour delay, the game eventually resumed, and after Gabe Terry doubled in Riley Rosario, extending the lead to 6-3, closer Nate Thomas closed out the semifinal win. 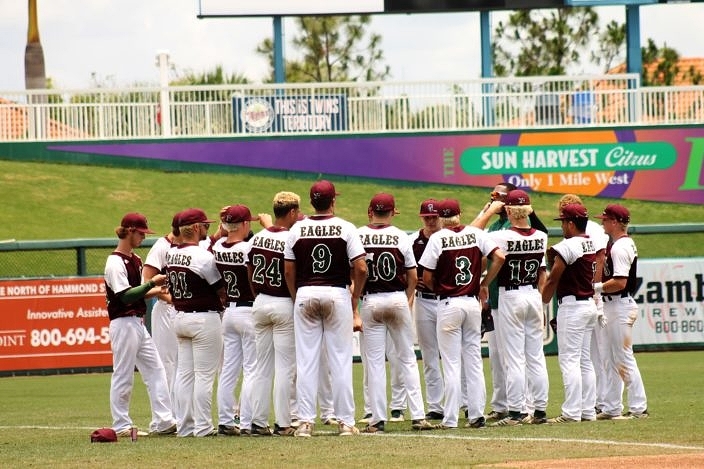 St. Thomas will move on to face Sarasota in the 8A title game, on Saturday at 5PM. The game features a Sailors team looking for their ninth state title, and a Raiders team hungry to return to the top of the mountain. For Jenkins, their magical season ends on a sour note, but takes nothing away from all the Eagles have accomplished the past couple years. With the precedent of state appearances set, the team will look to reload for another run in 2019.